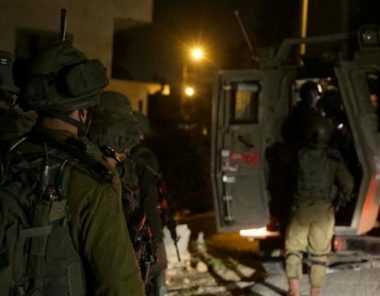 Israeli soldiers invaded, on Wednesday at dawn, the southern West Bank city of Hebron, and the nearby towns of Surif and Yatta, searched several homes and abducted one Palestinian. Media sources in Hebron said the soldiers abducted a young man, identified as Ahmad Mahmoud al-Hoor, from his home in Surif town, west of Hebron, after violently searching and ransacking his property. They added that the soldiers also invaded homes in Yatta town, south of Hebron, including the home of Younes Heinz, a political prisoner serving a life-term in Israeli prisons. In addition, the soldiers invaded and searched several homes, owned by members of al-Ja’ba family, in Jabal Johar area, in addition to the home of Issa Baradeyya, in the al-Kassara area, in Hebron city.